A new school year has begun, and with it comes a new round of measures to keep kids safe. Granville Board of Education vice president Phil Burke (l) welcomes officer Tom Schilling to the district. Amidst a time when schools and law enforcement officials must be cognizant of threats including school shootings, given recent incidences in Parkland, Florida and even closer to home in Fair Haven, Vermont, several are partnering to install officers in educational buildings. “I don’t think any school wants to be without one right now,” said Granville school superintendent Tom McGurl. Granville was a trailblazer for installing an officer in its halls. It contracted with the Granville Police Department in 2016 to bring Sgt. David Williams into the school as an armed resource officer. 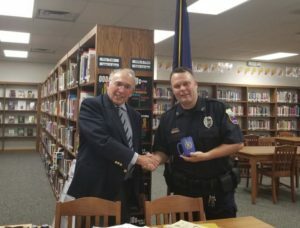 Officer Tom Schilling this year replaces Williams, who retired at the end of the 2017-18 school year. “It adds an additional layer of expertise to our security and building management,” he touted. The school contracts with the Village of Granville, paying for the officer’s salary, liability insurance costs and training costs to have an officer assigned to the school’s buildings. This spring, Washington County Sheriff Jeff Murphy met with school superintendents from throughout the county to discuss the implementation of school resource officers. Locally, Hartford and Whitehall contracted with the Sheriff’s Office for this school year. Granville decided to stick with its local police department.